Rising waters breached levees along the Missouri River in late March. According to NOAA’s spring flood outlook, flood risks will remain significantly high for the duration of spring. And not just in the Missouri River basin. Here’s what the report has to say about three of Kansas’ major waterways. Flooding in the upper Missouri River basin, which includes parts of northeast Kansas, has already broken records this year. Meteorologists at NOAA say a number of unusual circumstances added up to a major problem. It started with a large amount of late spring snow in the Dakotas and Minnesota. Then rapid snowmelt and a bomb cyclone dropped even more water on already saturated or still frozen ground. “It was like falling on a paved street," said meteorologist Bob Holmes. "It had nowhere to infiltrate, there was no natural infiltration, and so every bit of that ran off." Additional spring rain and melting snow will prolong or expand the flooding that is already happening. 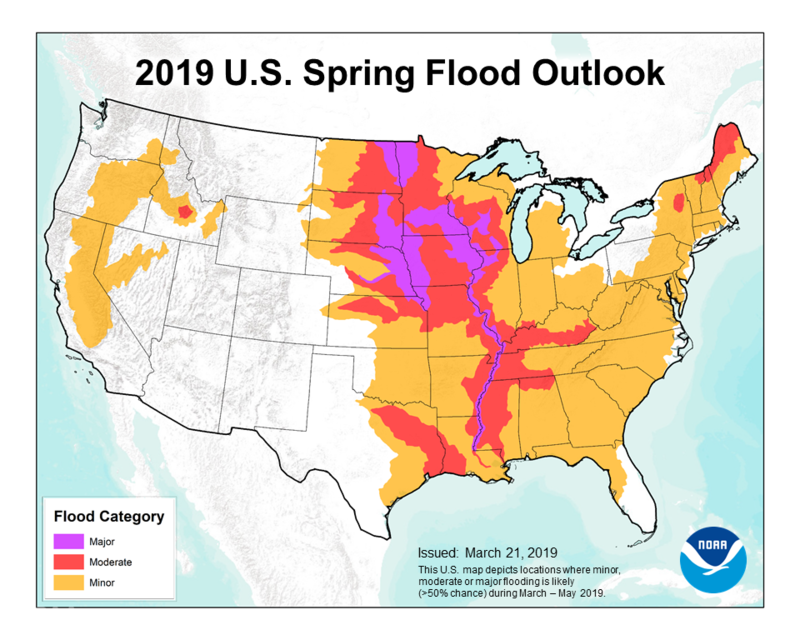 The outlook predicts that the Missouri River from Kansas City to the Kansas-Nebraska border has greater than a 50 percent chance of major flooding this spring. “Major” meaning flooding that causes extensive inundation of buildings and roads and prompts large scale evacuations. This map depicts the locations where there is a greater than 50 percent chance of major, moderate or minor flooding through May 2019. The areas that feed into the Kansas River basin do not have nearly as much extra snowpack as the feeders of the Missouri River basin. The greatest risk in the Kansas River basin instead lies with the chance of greater than normal rainfall falling on saturated ground. That’s one of the reasons why NOAA’s spring flood outlook only puts the Kansas River basin at risk for moderate flooding — flooding with some inundation of buildings and roads, but less cause for evacuations. The Kansas River basin also includes several reservoirs used for flood control, such as Milford Lake which receives water from the Republican River, and Tuttle Creek Lake which receives water from the Big Blue River. Because the Kansas River ultimately flows into the Missouri, which is already at record highs, the reservoirs have been set to release only the minimum amount. So the lakes are at higher than normal levels. “We have folks on the upper end of Tuttle Creek who have bottom ground, farm ground, coming into Tuttle Creek that is underwater right now,” Earl Lewis, Acting Director of the Kansas Water Office, said. Tuttle Creek is 35 feet above normal, and at 40 percent of its capacity for flood storage. Some of the campgrounds around the lake have delayed their opening until the end of April because of the high water. Unlike the other two rivers on this list, the Arkansas isn’t as likely to burst its banks this year. However, the NOAA forcast does predict a risk for minor flooding that would lead to minimal property damage, but could pose some public threat such as the flooding of roads and low lying areas. The greatest risk to the Arkansas will come from spring thunderstorms that drop a large amount of water in a short amount of time. Couple that with ground that’s saturated and you have a recipe for flooded streets and small creeks overflowing.